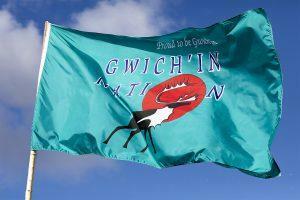 The Gwich’in Nation flag flew during the week long Gwich’in Gathering in June 2018 in Tsiigehtchic, Northwest Territories, Canada. Photo by Keri Oberly. 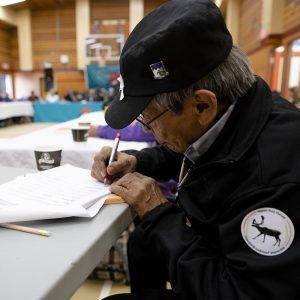 In June, delegates of the Gwich’in Nation unanimously reaffirmed a resolution to protect the birthplace and nursery grounds of the Porcupine caribou herd. The resolution calls for the United States Congress to recognize the human rights of the Gwich’in people by permanently protecting the coastal plain of the Arctic National Wildlife Refuge. The resolution, first passed in 1988, establishes the Gwich’in people’s reliance on caribou for food, clothing, shelter, tools, and life itself, and asserts their inherent right to live their way of life. After showing unity behind the resolution, Gwich’in chiefs and leaders from the Yukon, Northwest Territories, and Alaska signed a statement reaffirming the role of the Gwich’in Steering Committee. Bernadette Demientieff, executive director of the Gwich’in Steering Committee, said the show of unity and connection reflects the strength of the Gwich’in people. Future Gwich’in leaders stand for their future by fighting to protect the Arctic Refuge. Photo by Keri Oberly. 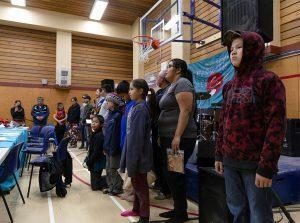 The Gwich’in Gathering has taken place every two years since 1988. This is the first Gathering since the United States Congress passed a tax bill that allows oil and gas activities in the Arctic Refuge. 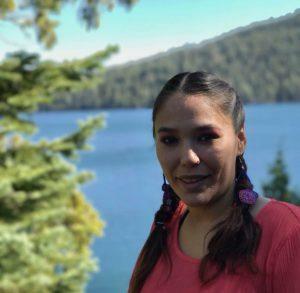 Demientieff says she has faith that the people in Alaska and the rest of the country will unite and protect the calving grounds of the caribou and one of the last untouched ecosystems in the world. 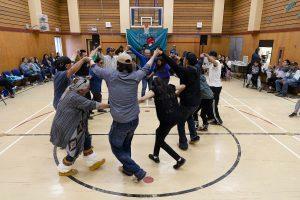 The Gwich’in Gathering includes meetings, stories, music and dancing. Photo by Keri Oberly. Demientieff said the Gwich’in Steering Committee will continue educating people across the country and around the world about what’s happening on Gwich’in lands, and teaching Gwich’in people how to speak publicly to protect the Arctic. People can go to www.ourarcticrefuge.org to learn about the Gwich’in people and take action. Specifically, Demientieff asked that people write in support of protecting the Arctic Refuge to their congressional delegation, newspapers, and investment firms. A delegate signs a statement of support for the Gwich’in Nation and Gwich’in Steering Committee’s work to protect the Arctic Refuge. Photo by Keri Oberly. “I honestly think your voice is the most powerful tool you have and you’ve got to use it, “ said Demientieff, who will receive the 2018 Alaska Conservation Foundation’s Caleb Pungowiyi Award for Outstanding Achievements by an Alaska Native Organization or Individual.